The seemingly never-ending stream of seasonal food items continues via the multitude of convenience stores. One of the downsides of this extremely popular concept is that the items routinely sell-out quickly and often well before the end of their ‘season’. This phenomenon then triggers a ‘pull-though’ effect in order to keep the shelves full. 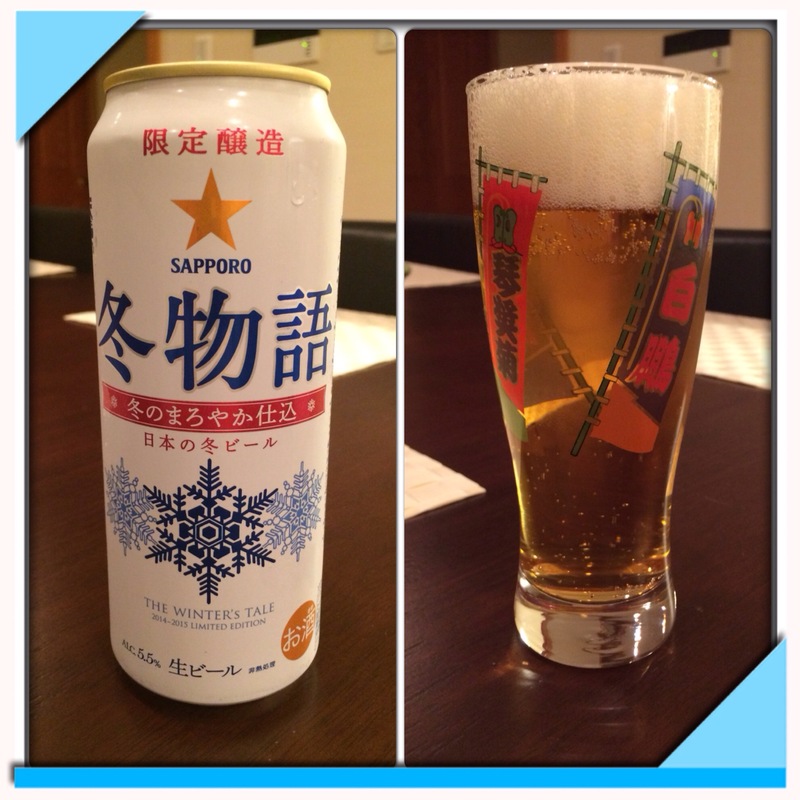 This week’s resultant of the aforementioned cycle saw the arrival of Sopporo Beer’s winter offering, The Winter’s Tale. As a consumer, even though it is still Fall (Aki in Japanese), if you wait you will likely miss out. Now, you might say that we could just buy a bunch and then wait for Winter (Fuyu in Japanese) to arrive in order to have a taste. But, as you have read here before, not all seasonal offerings are worthy. So, we decided to give it a try. Light and crisp, Winter’s Tale was good (let’s say a 7 on a scale of 1 to 10); maybe deserving of a six-pack advance purchase to then be saved for a frosty day when the actual season rolls around. This entry was posted in food, mike on October 23, 2014 by jules453. We have covered many, many times how popular seasonal food and drink offerings are in Japan. While these are most commonly found at the convenience stores, it is definitely not exclusive to them. 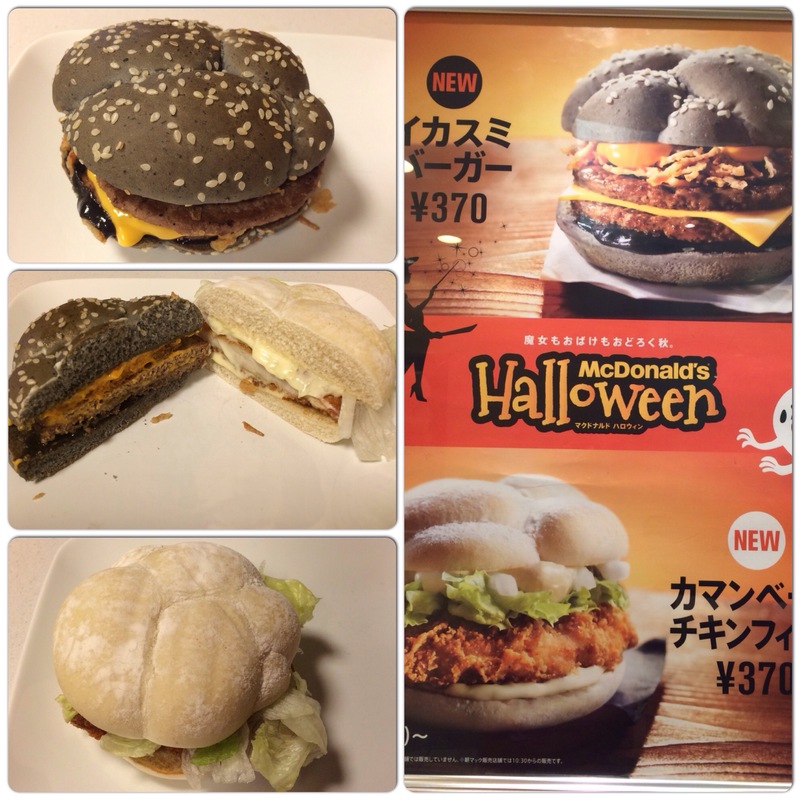 In what may be an answer to Burger King’s black burgers, McDonald’s has leveraged Halloween and introduced two limited-time sandwiches of their own. So, what to choose…the White Ghost Chicken Sandwich or the Black Witch Burger? Of course, we didn’t bother choosing between them, we just ordered both. The chicken sandwich was the tastier of the two with an interesting ‘kick’ infused into the mayonnaise. And, in the battle of black burgers, Burger King’s Black Diamond Burger is the clear winner. This entry was posted in food, mike on October 22, 2014 by jules453. Another one of the fall matsuri festivals was held this weekend in Nihombashi, one of the older settlements of Tokyo. By older, we are talking pre-Edo period, before 1650 when the Shogun moved the capital of Japan to Tokyo. Today, we celebrated the daikon— the Japanese radish. This fair is known for a number of vendors selling the local specialty called bettara-zuke, or sweet and salty daikon radish pickles. The celebration covered about 12 blocks centered around the Takarada Ebisu Jinja Shrine. Ebisu is one of the seven lucky Gods. He is the one of good fortune and honest labor. 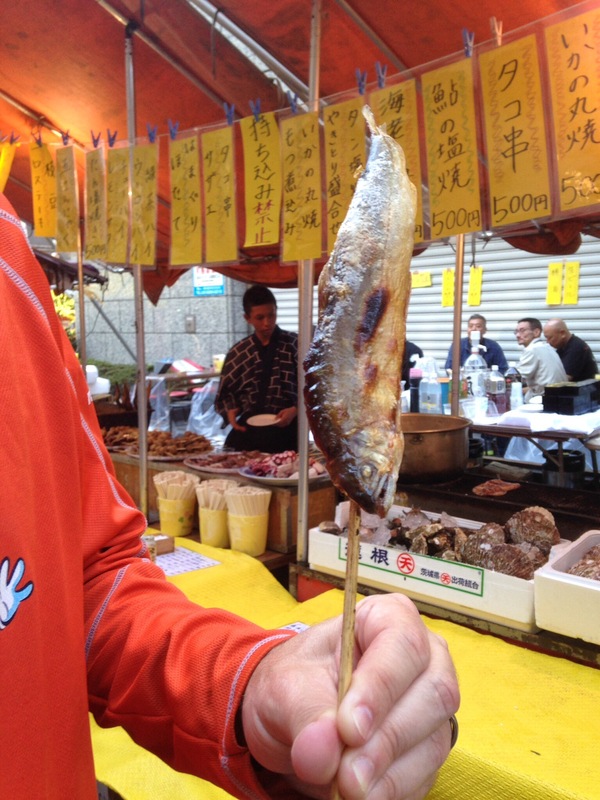 In addition to the pickle vendors, there were over a hundred other stalls that specialized in other Japanese fair foods, including many that featured the always popular, fish-on-a-stick, which is slow-cooked over smoky charcoal. This entry was posted in culture, food, julie on October 19, 2014 by jules453. 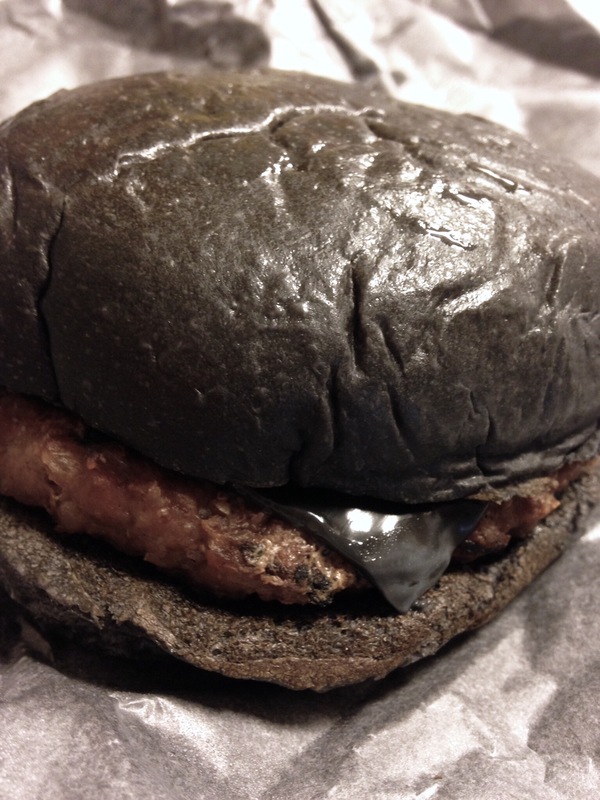 We had a special request a few weeks ago to find the black hamburger in Tokyo. Well, find it we did. This is the Black Pearl cheeseburger offered by Burger King, Japan. It is a very simple burger: charcoal colored and seasoned bun; smoky, charcoal cheese, a peppery beef patty, with a squid-ink, shoyu (soy sauce), garlic sauce. Initially, we were slightly hesitant to have a go at this burger–the appearance was a bit of a shock and we were not sure how the flavors would play out. There are many mixed reviews out there on this sandwich, but we are pleased to report that we put the burger in the thumbs up category. It was a decent fast food burger with a smoky, spicy tang. This entry was posted in culture, food, julie on October 18, 2014 by jules453. 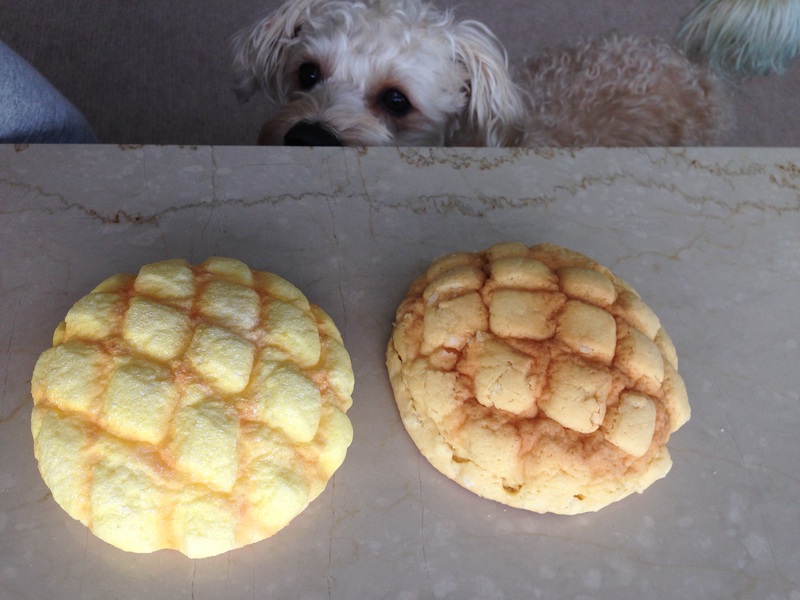 The fake pastry is on the left, the one that Xeno is sniffing. The real one is on the right. This entry was posted in Uncategorized on October 14, 2014 by jules453. This lemon candy was a new discovery for me a few days ago in geometry. A friend of mine pulls out this candy and gives me one to try. 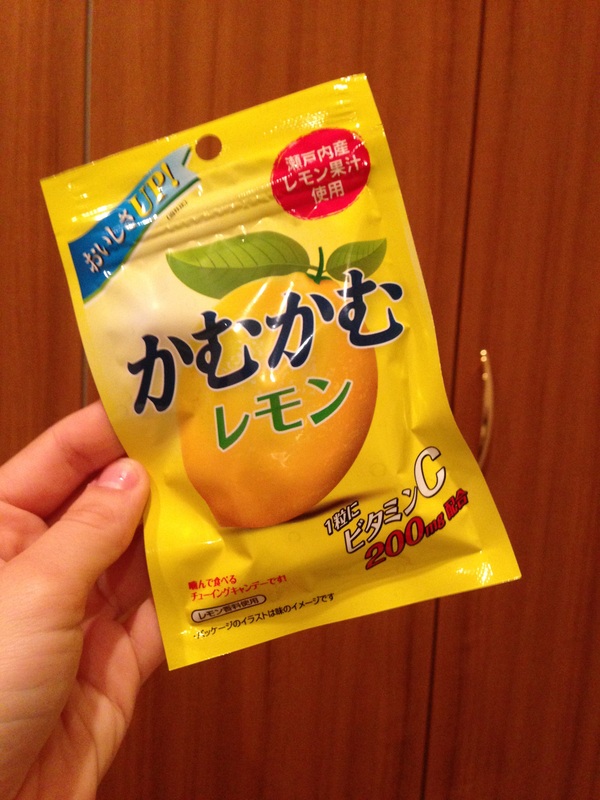 She explains that it has Vitamin-C and that it helps you get over a cold. Naturally I had to get more to try it out. In the morning a few days ago, I have a sore throat and a slight cough, so, I tried one and sure enough it helped! It might have just been a placebo but I’m keeping my eyes open for more healing candies. This entry was posted in food, meg on October 12, 2014 by jules453. Melon Bread doesn’t have anything to do with melons at all. It is literally sweet bread with a slight sugar crust blanketing the fresh bread. I love melon bread even though it has absolutely nothing to do with melons. I know that you know all about fake food here in Japan. They are point in looking like the real thing, so today I’m juxtaposing them too see if the difference really is hard to on to the real thing. Can you guess which is which? This entry was posted in food, meg on October 6, 2014 by jules453.